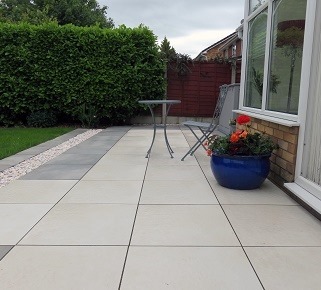 In this PrimaPorcelain case study, our customer Ray explains how he used our beautiful porcelain paving products to transform the back garden of his home in Blackpool. My garden was designed from scratch ten years ago when we first moved into the house, which was a new build. The back garden was a blank canvas, and I went for a traditional look: lawn with shrubs and flower beds, plus a patio using basic concrete paving slabs. As time passed, the garden matured and looked fine, but the patio started to look pretty terrible. Eventually, I decided that I would start again and go for a more contemporary design this time. I started by ripping up all the old paving and using the slabs as a base for a new shed and decking area, but my main plan was to extend the old paved area with something a bit special. I love the indoor/outdoor transition that can be achieved with porcelain tiles – we see this in trendy bars and restaurants that open up their sliding doors in the summer, and I think that running the same tiles from inside to outside creates a fantastic look. I don’t have a bar or restaurant, but I couldn’t see any reason why the same effect wouldn’t work in a normal garden. We have a conservatory with a white floor, so I decided the outdoor tiles had to be white as well. I began by requesting samples from all of the tile companies I could find online, although at this stage, I was still unsure about using porcelain tiles. Would they look right? Would they be durable? Would they be slippery? I had a lot of reservations. Also, everyone seemed to say that the tiles had to be glued to a solid surface, which seemed like a very big job. I contacted a couple of the companies I had come across to ask a few questions, and this is where PrimaPorcelain stood out. I spoke to Vishal and he was most helpful – I liked the Sandstone White sample, I liked Vishal, and so I made the decision to go ahead with PrimaPorcelain. 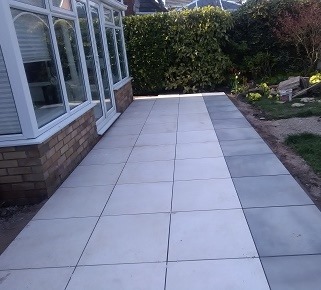 After some consideration, I decided that using white tiles alone might not give me the special effect I wanted, so I settled on a design that combined contrasting white and grey paving slabs. I arranged a delivery date and the tiles arrived on the specified day – they were well packed, and it was obvious from the word go that this was a quality product. 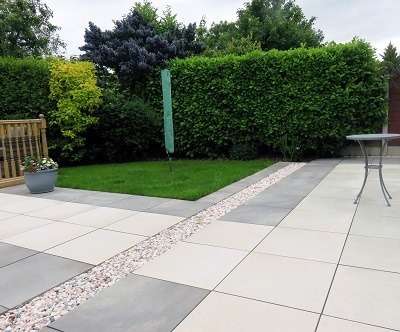 The paving was easy to lay, and once grouted, the effect was spectacular. The patio and the section leading up to the deck have now been down for approximately seven months and still look as good as new. Every now and then, after I’ve cut the grass, I’ll run the hosepipe along the paved area and wash off any surface grass or dirt. This only takes 10 minutes at the most. Occasionally I will throw a bucket of soapy water down prior to using the hose, and this brings the tiles up beautifully – I have never had to scrub them or do anything else to keep them looking good. Everyone who sees the finished garden has the same reaction: wow! 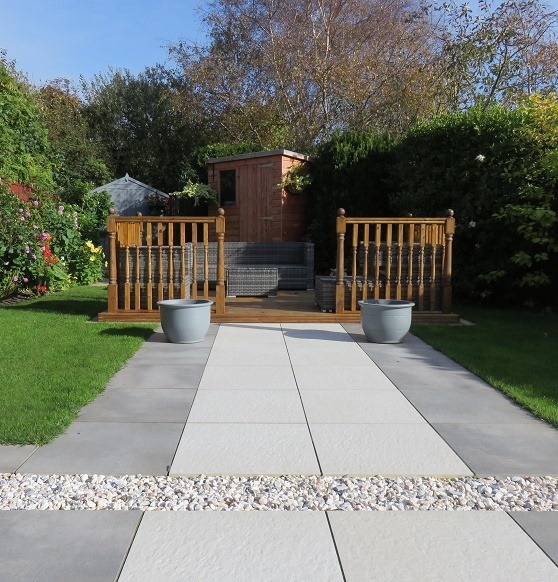 The decking is eye-catching and the flower borders are good, but the porcelain paving is what really makes it special. The tiles aren’t slippery at all, no moss can grow on them, and dirt and marks just wash right off. I will never use traditional or stone paving again. Finally, I’m pleased to say that the indoor/outdoor transition I originally wanted has been achieved. Sitting inside the conservatory, the garden now looks like an extension of the house. It all comes together, and I couldn’t be happier. Our thanks to Ray for his feedback. If you’re thinking of using porcelain paving in your garden, PrimaPorcelain tiles are streets ahead of the competition – order your free samples now!